When I first heard that Neighbourhoods for a Sustainable Vancouver (NSV) was running just four candidates for city council it was pretty apparent that today’s news was coming. At the COPE nomination meeting last month, there was an almost obvious tension between the COPE executive and Tim Louis’ supporters. Louis ended up bumping off incumbent councillor David Cadman, and has long been critical of the electoral alliance with Vision Vancouver. Now, with NSV endorsing the COPE slate, those who have been disappointed with Gregor Robertson over the past few years have alternates for council and mayor, without endangering any COPE candidates. This even helps Adrienne Carr and the Greens, who are also likely to get an endorsement. What complicates this even further is that NPA isn’t even running a full slate for Park or School Board (6/7 and 5/10 respectively), and NSV is only running for Council and Mayor. The Greens are only running one candidate for each of those positions. A poll released last week suggests that almost anything could happen. The poll doesn’t include NSV or their mayoral candidate Randy Helten, so mayoral support splits 66-32 for Vision. The results for council are less clear, especially since they found 19% support for the Greens, while only 11% for COPE. The poll doesn’t list its sample size or margin of error, so it’s worth questioning some of the numbers. It should be an interesting election. In a huge upset win last night, Alison Redford pulled ahead of favourite Gary Mar to win the Progressive Conservative leadership and became the next premier of Alberta. Mar was a powerful minister in Ralph Klein’s cabinet and had hoped to used that connection to his advantage. Nearly the entire PC caucus had endorsed Mar. But similar to how Christy Clark won the leadership of the BC Liberals earlier this year, Redford became the anti-establishment candidate, rallying the votes needed to win. "I know that I am leaving this province in very good hands. We have a very good team and a strong group of Progressive Conservative supporters," [Mar] said. "And I say ‘progressive’ conservative supporters, that’s very important." Redford was seen as the more moderate candidate, one who would keep hospitals and schools open, while Mar had openly mused about more health care privatization – a cause he championed for Klein as health minister. By electing Redford as leader, the PCs now risk losing a few more right-wing members to the extremist Wildrose – a party that had been stalled in the polls recently. This move also threatens newly-minted Alberta Liberal leader Raj Sherman’s ability to offer a stark alternative to the PC dynasty that has ruled Alberta for more than four decades. Sherman had joined the Liberals after being kicked out of the PC caucus. It may also put the brakes on the Alberta Party, created as a grassroots centrist option. Redford’s come-from-behind win is likely to make some PCs recall Ed Stelmach’s unlikely win in the last leadership convention. As the compromise candidate between the more right-wing Ted Morton and more progressive Jim Dinning, Stelmach offered little offensive to party members, and correspondingly offered little of substance as premier. Perhaps we’ll see a revolt against preferential ballots in the party. In my personal opinion, Redford was the best choice for the PCs, her win symbolically ends the “old boys club” that has dominated Alberta’s political scene for decades and sets up for an election pitting her against the media darling Danielle Smith. Did I mention I’m running for School Board? If you’re not following me on Facebook or my personal blog, you may have missed my initial announcement that I’m running for one of the Coalition of Progressive Electors (COPE) nominations for Vancouver School Board. Posted on 19 Aug 2011 Categories Elections, Personal, Politics, School, Vancouver3 Comments on Did I mention I’m running for School Board? With the HST referendum underway and ballots supposedly in the mail (I should have mine in the next couple days…) I’ve had a thought that there may be a bigger question than the subtleties of consumption taxation. The question has to deal with two issues near and dear to my heart: Democracy and evidenced-based policy. Disregarding whether or not the HST is smart, rational policy, it must be evidently clear that its implementation was anything but democratic. Harmonization was announced within weeks of an election which gave not a peep to the issue, and the paperwork was signed in such haste that it seemed negotiations had been going on for months (which they may or may not have been). With no opportunity to fairly weigh the pros and cons of this policy, the public was left scathing at every extra dime spent on every cup of coffee and haircut. So my question is about priorities. While we should want a government that only brings forward rational, evidenced-based policy, can we let that come at the expense of democratic participation? In other words, is being right or being heard more important? My first inclination, and I won’t claim to have a final answer on this issue that has only arisen in me this evening, is that we should prioritize democracy and accountability even at the expense of rational policy. History has given us countless examples of dictators and tyrants who grow increasingly corrupt when unchecked. The benevolent dictatorship is a fiction, and while far from perfect, democracy is still the least bad system of government to date. And so it is partially to re-affirm that requirement of accountability that I feel compelled to vote Yes to scrap the HST. There are only so many chances to chastise one’s government, and while the policy may or may not be good for the province, the lies around its implementation require reprimanding. Posted on 5 Jul 2011 Categories BC, Elections, Politics1 Comment on Democracy or policy? So the referendum is technically on for the BC HST; however, with the postal strike, it’s hard to know when I’ll actually get my ballot. Nevertheless, when my ballot does come, I will be voting yes to extinguish the HST. Of course, it’s not a simple issue. The HST is a simpler tax for businesses and requires only one set of paperwork to fill out. I normally wouldn’t care about arguments from business (since they tend to be trite and only further the privileged), but I can imagine that this extra bureaucracy negatively affects the small, local business owner more so than the (multi)national corporation who just pockets a bit more at the end of the year. I also support a consumption tax from an environmental point of view as a means to curtail excess and reduce waste. Of course, this is made null by Premier Clark’s promise to eventually lower the HST to 10%, hence the 12% PST+GST option is a better deterrent. Further, the PST option retains the ability to target specifically bad (or good) items with extra taxes or exemptions. This was the case with the luxury car tax and restaurant exemptions under the old scheme. Ideally the federal government would agree to pass legislation for anything we wanted exempted provincially, but perhaps I’m just cynical. Selfishly, I also like that as a poor student I get a larger HST rebate than under the old system. Then there’s the “stick-it-to-the-man” argument, which is fairly irrational, but is an effective way to demonstrate that decisions cannot be made by executive fiat as Gordon Campbell did. One could argue that the successful petition drive, Campbell’s resignation, and Clark’s long-term promise to reduce the tax demonstrated that the government heard and cares what the people said; however, by voting in favour now, it somewhat forgives and forgets the original misgiving. I’m not convinced that the government has actually listened, and recent actions seem to suggest more unilateral action. This referendum represents a chance to actually reverse government policy. So in summary, my main reason for choosing the “Yes” side to the exceptionally poorly-worded referendum is that I prefer a higher consumption tax that we, as a province, have greater control over. 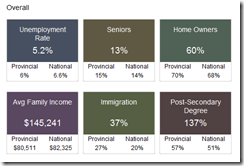 Canadian politics are plagued by an archaic electoral system where whoever gets one more vote than second place gets sole command over their constituency. This practice is known formally as “single-member plurality” or first-past-the-post voting and remains in use only in Canada, the UK, and the USA. When Canada was founded, and only 2 major parties existed, the system made sense. However, once a third candidate enters the race, the system breaks down and screams of “vote-splitting” are rallied from every party in an attempt to sway voters to their camp. The right-wing in Canada argued, successfully, to their base that the split between the Canadian Alliance (formerly Reform) and the Progressive Conservatives was costing them elections. After merging, they soon won a minority government (although have still failed to break 38% in an election. In 2008, and again this year, there are cries of vote-splitting on the left, and many projects attempting to rally voters behind “progressive” candidates (meaning primarily Liberal, occasionally NDP, and one Green) in swing ridings, in an attempt to take down the Conservative government. While good-spirited, these motivations are flawed by design for several reasons. This past Wednesday I attended my local riding’s all-candidate’s debate at UBC, hosted by the Professor Emeritus Association. All of our candidates were in attendance, including incumbent Liberal Joyce Murray, NDP Victor Elkins, Green Laura-Leah Shaw, and Conservative Deborah Meredith. The debate was 2 hours, with opening and closing statements from each candidate and then all questions from the floor. A number of people, including myself, tweeted the event, and you can find that conversation (as well as later debates) under #quadradb8. Here’s a summary of my thoughts in a more fleshed out way. 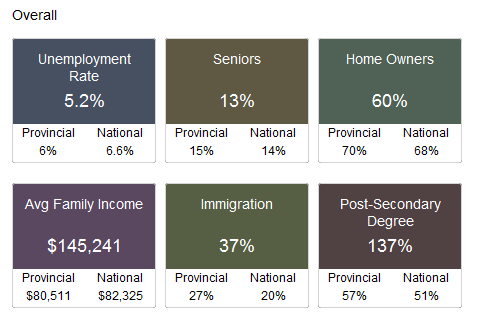 That’s right, a full 137% of us have post-secondary degrees. Just not in math I guess. No votes cast Wednesday in a special ballot at the University of Guelph should stand, according to the Conservative Party of Canada. The party wrote Elections Canada on Thursday to request that none of the votes collected during the U of G session be included in the final tally of votes in the Guelph riding. The letter was sent by lawyer Arthur Hamilton, of Toronto-based law firm, Cassels Brock. In his letter, Hamilton alleges the polling station was illegal and also that partisan election material was present at it, which is a violation of the Canada Elections Act. The polling station in question was located on the main floor of University Centre, where approximately 700 students cast sealed ballots. Those Afghan Detainee Documents will not be released until Parliament resumes, rules the remaining 2 judges overseeing the details. Note that despite Con Laurie “Red Dawn” Hawn’s assertion that the report should be released, in this case it’s the Conservatives that possess the originals, and they never needed to go through this committee to make any of it public. At least Layton had the sense to boycott this sham from the start. If you’re “ethnic” the Conservatives want you to dress up for them. Not sure if “very ethnic” need apply. Finally, my only comment with respect to the Auditor General’s G20 report, is that while I would love it to be released, I think that the rules of our Parliament have been disregarded enough under Harper, and that no matter how many petitions or half-sincere calls from Harper are made, it shouldn’t be released for purely partisan motives (of course the RCMP shouldn’t bust in to party headquarters during an election either). Perhaps the rules need changed, but we should follow them for now. 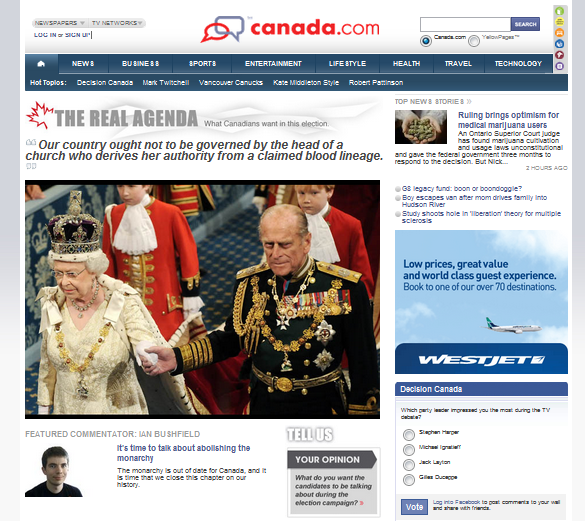 I got another piece published on the front page of Canada.com in the “Real Agenda.” This time I argue that it’s time to due away with the monarchy. The power of our Prime Minister’s Office has been growing in leaps and bounds since Trudeau sought to centralize the effectiveness of his rule. One of the few checks on the PMO is our beleaguered Governor General, yet the past few years have seen a precedent that not even he or she can stand in the way of the Prime Minister. Coupled with the general disinterest in the upcoming nuptials of Prince William and Kate Middleton, it is time that our politicians start discussing whether Canada should remain a monarchy. In the recent Australian elections, Prime Minister Julia Gillard made headlines across the Commonwealth by declaring that it was her belief that once Queen Elizabeth II passes the throne along, Australia should become a republic and abandon the monarchy. This statement is less shocking Down Under, where the debate about republicanism has been raging since a failed 1999 vote to replace the monarchy with a president elected by two thirds of the Parliament. The option failed to appeal to all republicans, yet still 45 per cent voted for a republic. A December poll by Vision Critical revealed that a vast majority, 70 per cent, of Canadians are not interested in the upcoming wedding. More Canadians preferred “no monarch” after the Queen abdicates than either Prince Charles or Prince William. Traditionalists will naturally disagree with me. Personally, I have little time for arguments about the value of doing things the same way they’ve always been done, since that is what has kept various forms of bigotry, from sexism to slavery, around for so long. Furthermore, our increasingly pluralistic country ought not to be governed by the head of a church who derives her authority from a claimed blood lineage. This system hearkens back to days of a deep social divide between peasantry and nobility, when blasphemy was punishable by death. The other argument routinely trotted out against abolishing the monarchy is that we risk centralizing more power in the already powerful PMO. Yet, as the failed Australian referendums demonstrated, this could allow Canadians the chance to put a new democratic check on the executive branch. By establishing an elected Canadian president, we could have the chance to actually vote for who leads us, instead of electing a local backbencher. Alternatively, we could retain the Governor General’s office as an appointment, but strengthen the position such that the prorogation crises could be avoided. The monarchy is out of date for Canada, and it is time that we close this chapter on our history and work toward becoming the Republic of Canada. Ian Bushfield is president of the B.C. Humanist Association and blogs at terahertzatheist.ca and canadianatheist.com.